Setting up a self managed super fund? You must know the rules and risks! Australians are offered many tempting tax incentives to save for their retirement via the superannuation system. You can choose between superannuation funds that can manage your savings for you or the do-it-yourself option of a self-managed superannuation fund (SMSF). However, managing your own retirement savings is a huge responsibility that should not be viewed lightly. How you live and how comfortable your life will be when you’re no longer earning an income will depend largely on your efforts towards saving and the investment performance and management of your super fund. And while the hands-on aspect of setting yourself up with your own SMSF is a great way to take control of your retirement savings, it is not recommended for everyone. 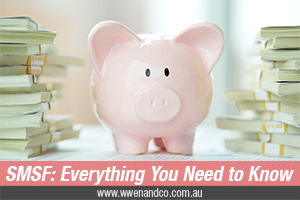 There are strict rules and tangible risks to setting up an SMSF, but at the same time you can choose how to invest your fund’s money, giving you flexibility over your investment choices. With an SMSF, you are responsible; you are the trustee of your own fund, which means that you need to comply with the superannuation laws and regulations, and you bear the consequences of all your investment and compliance decisions. Two thirds of Australia’s pre-retiree population park their superannuation savings and direct their compulsory superannuation guarantee contributions (and any extra contributions) into a large funds. These funds are pooled with the super of other members and professionally managed by the trustees of the fund. If you set up your own SMSF, then you’re in charge; you make the investment decisions for the fund and you are responsible for complying with the law. It’s important to note that one advantage that larger APRA-regulated funds may have over SMSFs is a compensation scheme for fraud. Deciding whether to take the SMSF route depends on your personal situation, and this is certainly one instance where professional advice and the pursuit of adequate due diligence is time and money well spent before deciding. If you do decide to set up an SMSF, make sure it’s for the right reason; saving for your retirement. Don’t set up an SMSF simply to try and get early access to your super, or to buy a holiday house or sports car. The ATO’s compliance (and penalty) regime has strengthened considerably since such stories were swapped amongst friends. These sorts of “investments” do not comply with superannuation law, and the ATO will come down hard on SMSFs implementing these tactics. meet all your legal obligations as a trustee. As an SMSF trustee, your main responsibility is to ensure you have invested your fund’s money appropriately. You will need to ask yourself if you are a confident and knowledgeable investor, and will the SMSF do as well as, or better than, other super funds after you’ve paid all costs? If you’re not confident you can get a better result, there is always the option of a retail or industry super fund. The cost of establishing and running your SMSF depends on the number of members in your fund (the law rules that there can be no more than four) and the complexity of the arrangements, the extent to which you make use of professional service firms (an annual independent audit is compulsory), and how much of your own time you will have to spend running your fund. All SMSFs are also subject to an annual “supervisory levy” from the ATO, which is $259 for the 2016-17 financial year (or $518 for newly registered funds). How long does it take to setup SMSF? Time is another factor that is rarely talked about when considering SMSFs. It may take weeks or even months to set up an SMSF, depending on the institutions you are rolling over your incumbent super savings from. Keeping on top of all administration tasks. The amount of time required to manage an SMSF varies from person to person. For instance, some trustees enjoy buying and selling shares, which requires frequent monitoring of the share market. Other trustees prefer to invest in assets that do not require such close attention, like investment properties. And remember, this office can always help you with the administrative tasks like record keeping, tax and conducting or providing guidance regarding the fund’s annual audit. Don’t forget – you will also be required to stay up-to-date with the superannuation and tax laws, as well as other issues that will affect your fund, such as changes in interest rates and market conditions. Last but not least, think carefully about your investment options and how you plan to manage the associated risks. Avoid risking all your retirement savings in one or a few investments. By spreading your investments – in other words, diversifying — you can help control the total risk of your investment portfolio. But spreading your fund’s risk means investing not just in different stocks or sectors but also across different asset classes. Depending on your investment strategy, your investment options might include cash accounts, term deposits, managed funds, listed Australian and international shares, listed property and direct property. That way, if one or more investments perform poorly, others may help cover those losses. Super funds, including SMSFs, receive significant tax concessions as an incentive for members to save for their retirement. However, you need to follow the tax and superannuation laws to receive these concessions. And failing to follow those laws can result in significant penalties. These can be severe, ranging from $900 (for not providing certain information to the ATO) to $10,800 (for not notifying the ATO of “significant adverse events”). One overriding obligation that every SMSF must meet is to pass the “sole purpose test”, which basically means that the fund is legally required to be maintained for the sole purpose of providing benefits to each member on retirement, or to their dependants upon the member’s death. Compliance with this obligation is fundamental; straying from it can lead to severe penalties. Another essential role of an SMSF trustee is to keep proper and accurate tax and superannuation records. It is always a good idea to keep accurate records, including taking minutes from meetings, of all investment decisions, including why a particular investment was chosen and that all trustees agreed with the particular decision. Additionally, you have a legal obligation to have your SMSF independently audited every year. The annual audit will require certain records to be made available, and you may also need to provide other records to the ATO to keep your fund compliant. However, it is not a requirement that such a policy be taken out. Life insurance can also be expensive compared to the large funds, which can buy group policies that enable them to offer insurance cover at a relatively low cost. If you decide to set up an SMSF, you’re legally responsible for all the decisions made, even if you get professional advice. Typically, an SMSF is suited to those who want greater control, but are also able to actively manage their investments while keeping up with the mandatory regulatory and compliance obligations. Appropriate advice is highly advisable before taking the plunge. Being at the helm of an SMSF can be a very rewarding experience, offering innumerable benefits – from tax savings and greater estate planning certainty to more investment control and wider investment choices. Just be sure it is the right option for you. For SMSF tax advice or concerns, please contact the accountants at our Epping office.